The third release in the BFI's British Artists' Films DVD series features Ian Breakwell (1943-2005), an artist who worked in many different mediums, with the moving image a constant part of his art-making. Over 30 years of Ian's filmmaking is surveyed. 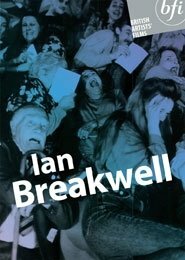 Included are his earliest to-camera readings from his written Diaries, Excerpts From The Diary , the film Repertory , his hilarious parody of broadcast television The News and the episodes Growth and The Walking Man from Annalogue's Channel Four Television series Ian Breakwell's Continuous Diary . Also included are two works that reflect his love of the alternative theatre traditions of variety, spectacle and illusion - Auditorium , and his brilliant response to a residency at the BFI National Archive, Variety . The British Artists' Films DVD series is produced in partnership with arts documentary producers Illuminations and Arts Council England. It features a wide selection of important film and video work by British artists from the last thirty years. Previous releases are William Raban and Chris Welsby . sleeve notes featuring a specially commissioned introductory essay by Will Self.